Moses Koech and Evaline Chirchir carried the day in the 15km Imenti South Road Race held on 9th December at Kanyuruko in Igonji, Meru County. Moses Koech cuts the tape to finish first in the 15 Kilometers race at the Safaricom Imenti South Road Race held today at Nkubu Stadium, Meru County. 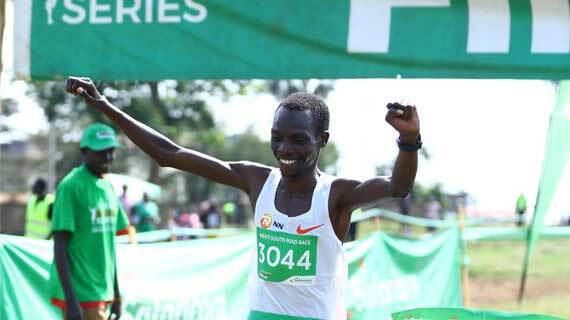 Koech emerged the new champion in the men’s category after clocking 49:24.0. The two braced the intense heat to win the top crown of the 15 KM road race on Sunday 9th December at Kanyuruko in Igonji, Meru County. Koech clocked 49:24.0 to beat Alexander Mutiso and Moris Munene who finished second and third in a time of 49:43.0 and 49:59.0 respectively in the men’s 15Km race. Debuting at the race, Chirchir beat a strong field to win teh women's edition as she crossed the finish line at 57:08.22 ahead of Lydia Njeri who came in second at 57:40.82 followed by Caroline Nyaguthi at 59:40.31 in the women’s 15Km race. “This is my first time to run in this race and I am so glad I made it. The road was hilly and weather very hot but I managed. I trained well and was determined to win. I am preparing to participate in the World Cross Country next year in Eldoret and hope to get good results,” said Moses Koech, Winner of the 15Km men. “The race was tough with very stiff competition from other athletes. Being my first time here, I’m glad I won. I am looking forward to defending my tittle next year,” said Evaline Chirchir, winner 15Km women. The road race themed Running for healthy and wealthy living comprised of 15 km senior race, 8km and 6km cross-country races for boys and girls, 4km for veterans, 800m races for boys and girls and a 2km VIP race. The Safaricom Imenti South Road Race has since inception attracted hundreds of local and international athletes offering a platform to nurture talents and promote athletics locally and internationally.